On Friday November 4th, 2016, Micheál Ó Doibhilín, MD of Kilmainham Tales Teo. addressed the Moore Street Consultative Committee in Dublin's City Hall. This Committee was established by Minister for (among other things) Heritage to address the issue of what to do with Moore Street battlefield Site and to report back to her. Mícheál was accompanied by historian and author Ray Bateson, and a copy of Ray's latest work for Kilmainham Tales - "The Battle of Moore Street" - was presented to the members of the Committee. Below is the text of Mícheál's address. Táimíd fíor buíoch díbh deis a thabhairt dom ár fís do suíomh cogaidh Sráid Uí Mhórdha a chur ós bhúr chomhair anso inniú. I thank you for the opportunity to present our vision of the future of the Moore Street Battlefield Site to you today. First, a little about me and those I represent as their publisher. Eddie Bohan, another historian who looks at specific aspects of the Easter Rising etc. These, between them, have written and had published over thirty major books on the history of the Easter Rising and aspects of it. Interestingly, Paul O'Brien, Shane Kenna, Ciara Scott, Rory O’Dwyer, are all, like myself, either guides or ex-guides of Kilmainham Gaol, with first-hand knowledge of working in a national monument with a major connection with the Easter Rising, and they and the rest of my authors all feel as I do that the Moore Street area in its entirety is the most significant extant battle site of that Rising and the ideal location to establish a permanent memorial. I spent 10 years working in Kilmainham Gaol as a guide and researcher and gained unrivalled insight into the operation of such a site of National and international importance. During my time in the Gaol, I estimate that I guided and educated well over a quarter of a million people – a top estimate would be 350,000. But they all educated me too, some in greater ways than others – but I will return to this anon. The Moore Street Battlefield Site has the potential to become a major asset for the city of Dublin that will far exceed any temporary and dubious benefit another shopping centre might provide beside the existing one. As the last remaining intact battlefield site of the Easter Rising it uniquely encapsulates all three sides of that conflict, i.e. the two opposing armies …. and the civilians caught between them. This must be borne in mind as we utilise the area to remember and commemorate the world-changing events that that Rising itself represents. Our vision is of a streetscape that emulates that of 1916, i.e. the battlefield as it existed at the time. To this end, of course, all the houses of the terrace from 10 to 25 should be restored sensitively to look much as they then did, and the laneways of such incredible history must be preserved and accessible. We want to see a place where the Battle of Moore Street and, through it, the 1916 Easter Rising, is remembered, celebrated, commemorated, researched and communicated to all. The Easter Rising was a pivotal event in the history of these Western European islands, and that involved and shared history should be on view for all to see, learn and understand. 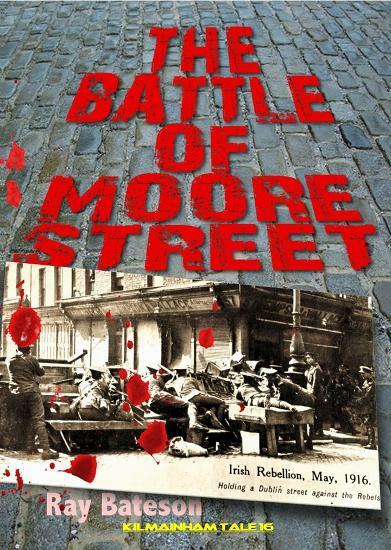 The battle of Moore Street was the concluding battle of the Easter Rising. It is not just about the surrender of the Republican army, but about the events that culminated in the decision to seek terms of surrender for the sake of the third element of the war – the civilians. We believe that the Moore Street of 1916 can live again in harmony with the 21st century and beyond in a way that will benefit all citizens of Dublin positively. We do not mean as some Hollywood screen set, a pastiche of false frontages – but as a practical, working street that serves as the major commemorative 1916 site in Ireland. My unique experience of 10 years working in Kilmainham Gaol has permitted me to come to some understanding of the needs and wants of the different types of tourists who visit sites such as this, and of how best to service them. In my time there I guided ordinary citizens from all over the world; I took specialist tours, including archaeological groups from our universities, political groupings from the four corners of this island and others; I took politicians from Ireland and other countries, historians, relatives of those executed or imprisoned; schoolchildren and university students. I advised on leaving cert presentations and university theses, and ultimately came to write and publish myself. But always I was watching, listening and learning. I quickly realised that there is no ‘one size fits all” solution, as there are different classes of visitor. Clearly, there would be those who would come to Moore Street to ‘gawk’ and have their photos taken with their selfie sticks, with no other interest than to say “I was there”. For them, the street should look authentic. Then there are those who want to hear the story, to add it to their store of knowledge and even learn enough to understand what was happening – for them the terrace must provide a sufficiently detailed informed overview in an interesting way in a short period of time. And there are those genuinely interested, who come with some fore-knowledge, who perhaps had a relative involved or know someone who had, and wish detailed information. For them, there must be facilities to dig deeper, to go behind the veneer and into the very guts of the Rising. Finally, there will be the researchers – those who, for school, college, university or publisher, wish more information, a greater understanding, of the events of 1916 and expect that that should be available here too. So, how do you satisfy these disparate needs? Assuming the site is properly conserved and restored, then the first requirement is a cohort of top class guides, people who know and understand the history, who can retell it in an inclusive, inviting and interesting manner, and discuss it with interested individuals. Language skills – i.e. knowledge of languages other than English and Irish – would be a requirement to facilitate the many foreign visitors to this site, of course. We saw in Kilmainham Gaol how important the story-telling skills of the guides were, and their ability to adapt – without changing – the story to suit different interest levels. It was important to have continuity of employment so that a guide would gain knowledge over time, becoming more and more expert over the years. The visitors appreciated this, as a glance at the reviews on TripAdvisor will verify – for they expected the guide to be able to either answer all questions or at least know where the answer may be found. Therefore, while acknowledging that some additional guides would be required during the seasonal high points, there should be sufficient permanent guides who are encouraged to carry out their own research and, if possible to publish … a point I will return to again. But what will these guides be guiding the visitor around? What will be there for the visitor to see? Apart from the streetscape, each and every building has a unique story to tell, as Ray Bateson has so eloquently verified in his book “Battle of Moore Street” through the words of those who were there which I have just published. Consider these houses as rooms in a modern, interactive museum – each room telling a part of the story the museum is dedicated to. I’m not a fan of too many audio-visual aids …. apart from anything else they slow down and therefore limit the stream of viewers, as both the Titanic Experience in Belfast and the new GPO centre will verify … but there must be in each building both visual reminders and interpretations of its past. In doing this we should not lose sight of those three sides of the Rebellion, and this is where they can best be addressed. Individual buildings can tell either the story of the Irish volunteers, story of the Irish volunteers, or the British soldiers, or the civilians. There are many contemporary or relevant later accounts which can be drawn on to give a thorough and fair account of each of these groups, one or more building each, as required. reproduction as suitable to their location and function – with maquettes and life-size models to engage and educate the visitor. The visitor should progress up the street from number 10 to number 25 in some orderly manner, led by their guide. Whether they travel up Moore Street itself, or the lanes around it or through the buildings via mouseholes is a detailed decision that can be made at a later time, and may depend entirely on the group’s interest. A self-guided museum taking over several buildings should finish the tour. Here some hands-on experiences can be incorporated – the opportunity to sit behind a British machinegun or to aim a rifle from a window, or to examine a field first-aid kit as used on either side for example – with as much audio-visual assets as the designers and historians deem necessary. Among the facilities here can be computers where one can carry out genealogical research or look up the newspapers of the period etc. A shop, of course, would be incorporated into the museum, where all kinds of souvenirs and memorabilia would be available – from flags, photos, keyrings to books, both specialist and general, but avoiding the tat that usually infests such shops. So far I have talked primarily about the tourist. But there are others who would wish to come to Moore Street, and who should be encouraged to do so. There are relatives of those involved on all sides, and should be welcomed and encouraged. To this end there should be always on site at least one resident historian (separate to the tour guides) to talk with and debrief these relatives as it is my experience that so much history simple walks in the door of sites such as this, brought by these relatives. Their specialist, focused knowledge needs to be garnered and recorded, their artefacts copied or accepted (if offered for donation) and their details recorded for future contact as required. This historian should be fully versed in the history of the Moore Street area in particular but also the wider Rebellion history and able to discuss this with the relatives. I found in Kilmainham Gaol that, by being able to do this re the Gaol’s history, I gathered so much additional information and many donations of invaluable material over the years. Of course, this site must also commemorate the events that occurred here, and the people involved. Annually there would be ceremonies both macro and micro, by the Government and individual organisations. There would also be ceremonies of commemoration at various other times of the year for many reasons and these must all be facilitated. Therefore one or more of the buildings must be able to house these events. A non-denominational or multi-denominational space should be created which, perhaps, could duplicate as a lecture theatre on other occasions. History, however, is not dead, nor is it ever completely known or understood, so research into the whole of the Easter Rising must continue and be encouraged. The events that led up to it, the individuals and organisations that took part in it, it’s effect on Irish, British and World affairs – these must all be explored and examined and understood. New times, events and discoveries bring new insights and understandings, and so this will be a never-ending journey. Some of the buildings in the Moore Street terrace should to house a research facility, with a world-class library – physical and/or digital – to enable researchers, both student and professional – carry out their research. Accommodation should be available upstairs to rent by these researchers, and in addition bursaries should be awarded to students in our major universities (and possibly those abroad) to come to Moore Street and carry out onsite research for their theses. These would be expected to give updates on their research in the onsite theatre throughout the year. There should be sections devoted to the two sides of the battle, and to the civilians caught in their crossfire. Histories of regiments and stories of soldiers should be presented in parallel with those of the Volunteers and individual insurgents, and joining them should be the stories of brave or unlucky civilians, for whom this battle cost so much. The smells and taste of 1916 Moore Street should also be available to the visitor. Whether this experience is provided within the prime terrace or not is debateable, however. There are only so many buildings, and such an amount of potential uses, that I believe current street businesses might usefully be encouraged to “theme” their premises on the far side and at either end and include cafes and restaurants to complement this historical quarter while reflecting the international character of our citizenry and visitors today. Grants should be available for this purpose – and this means that control would be exercised over what, exactly, they do. Such premises would be open late and, coupled with the resident researchers, caretakers and others in the historic terrace, would help to keep the street alive throughout the night as well as the day. street stalls and market – albeit today with produce from all over the world instead of just native farm produce – would help to attract visitors in their droves. But most of all, it is the history, architectural, social, political, that will attract people again and again, and ensure the longevity of this site. The Lord Mayor’s Forum has recently published a report which addresses many of the issues I have discussed today, and I do not find myself in conflict or disagreement in any major way with any of what that report says. In particular, I agree with its view that the actual streetscape be restored to its 1916 appearance as far as practicable and cleared of modern traffic during the day. Street lighting should be of the period, and the cobbles cleaned and visible. Just to be able to walk on the streets of history would be an incredible experience for so many. A place like Moore Street is a gift that keeps on giving. It gives to the city and people of Dublin in so many ways – it gives us pride in our past, it gives us knowledge of that past, and it gives us an income from it too. I helped take Kilmainham Gaol from c.75,000 visitors a year to 320,000 visitors a year during my time there, which brings me back to the need to have permanent guides. During my 10 years in Kilmainham Gaol I personally took approximately 336,000 people through it, and saw many people come back again and again. They came because, for them, each visit they gained more information and insight into the prison. Each year the permanent guides had new information and insight which they had gained during the year to share, and they appreciated that. As a permanent guide in Kilmainham Gaol I was able to provide continuity. I quickly became expert in the Gaol’s history – all aspects of it, social political, architectural – and trained temporary seasonal guides. I became the ‘go-to’ person whenever they had a query, or someone on their tours had a query they could not answer. I researched the Gaol’s various histories myself, and encouraged others to do so too. To this end, I established an in-house magazine for the guides, which they wrote based on their research. In this way they were encouraged to research and to get, in many cases, their first article published in a peer-reviewed publication. This magazine, which I called “Sentences”, quickly became a valued resource for all and was the most popular item in our library. Even today, although it ceased publication when I left, it is still referred to by all interested guides. There is scope for such a publication in Moore Street, not just for the guides but for the public. Whether it be monthly, quarterly or annually, the guides and researchers should be encouraged to contribute and would be an ideal vehicle for the publication of their latest research. It would also include news of upcoming events, photos and reports of commemorations etc. The magazine could be produced inhouse or by an external publisher – but it should be done, no matter by whom. And who’s going to do all this work – the renovation/ restoration of the buildings, their conversion to the envisaged usages, the running of the whole enterprise once established, the PR, the training, the budgetary management etc., etc? Who’s going to pay for it? If the Government considers it worth €6,000,000 to restore Kilmainham Courthouse, with little if any 1916 connection, or hands out €12,000,000+ for the GPO experience, or €12,000,000 to restore Glasnevin, then the money can – and must – be found for the Moore Street Battlefield Site. Put it out to tender if you wish, as a public/private partnership. Let those who wish to make money there tender for that right – those who currently hold planning permission for part of this site may see that, long-term, there is more to be made from this idea than the quick profit of yet another unwanted shopping mall which will only demean the area and, eventually, be abandoned as retail fashions change to online purchase and the sky is filled with Amazon’s delivery drones. Let these commercial interests, for once, become partners with our great city rather than its enemies. Let them profit through partnership, rather than division, through contributing rather than taking. So there you have it, our vision for the development of the Moore Street Battlefield Site into the future. A cosmopolitan street, yes, but one that is rooted firmly in Ireland, in 1916 and before. A street we can be proud of once more, and a street that will express its pride in its own history to the world. A street that will, at long last, explain our history to the world so that the world can understand it. A self-sustaining street that will become a major resource for this city, while ensuring we never forget what we owe to those who fought over its future there. Drawing on the recollections and words of those who were there, historian Ray Bateson retells the thrilling story of those two desperate days as the members of the GPO Garrison sought valiantly to fight their way out of the encircling rings of fire and British firepower that threatened to destroy them and those they fought to free..